Go Visit This Restaurant By Visiting SellingRestaurants Listing 5417. Then Select "Sign NDA" and Go on Your Own time! 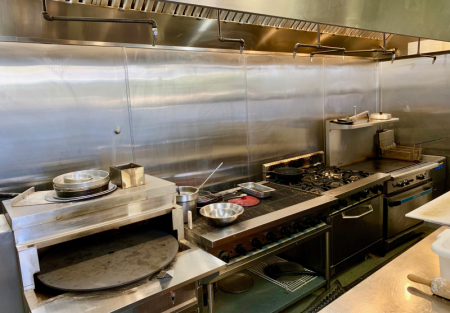 THE KITCHEN: Located in Oak Park, the East Ventura County area, this restaurant facility has a fully loaded kitchen with a 20+' hood system with a Char-Grill, Flat Iron Grill, 6 burner stove, pita/tortilla baker oven, two ovens and a dual tray deep fryer as well as a prep table. The prep area contains a walk-in cooler and a walk-in freezer with a variety of equipment to help make items such as humus, dough, slice meats, etc. THE FACILITY: There are just over 2,000 Sq. Ft. and the total all-in rent is just over $6,000 a month, making this one of the lowest rents in the area at all-in $3 Sq. Ft. The dining area seats 50 while the patio can seat as many as 20. There won't be a shortage of parking in this center as there is plenty surrounding the restaurant with little competition for parking spaces. UPSIDE: Add beer and wine to the menu and attract evening business. For religious reasons the current owner didn't obtain this license. The center doesn't have Mexican, Burgers, Wraps, Rotisserie Chicken, Japanese, Sushi, and many other concepts that are needed in the area. TRAINING: The owner is willing to train you for the current concept or you can change the concept and menu as long as the landlord approves it. NO FINANCIALS PROVIDED: At this price, no financials will be provided. This is an asset sale. The Owner is willing to provide utility costs to help the buyer plan.